We all have little things that make us feel like spring is really here. It might be flowers blooming, warming temperatures, seasonal allergies, or something completely different. One of my favorite signs of spring is the annual plant sale at our local arboretum. The Master Gardener program has an enormous plant sale with a large variety of plants. There are some good deals to be found and the plants are high quality. 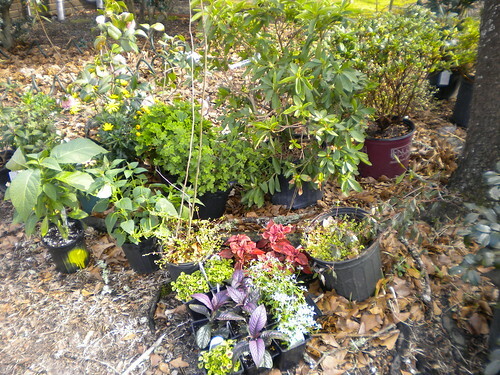 The picture below is a small sampling of what I will be planting this weekend! As you look as these plants, I ask you to pay respects because at least 50% of them will not make it. I am a notorious plant killer. Everything my parents touch grows, but I did not inherit that gene. My husband is learning to grow more plants and therefore is beginning to save them from my curse. What is your favorite, hard to kill plant? Does it grow in the southeast? Let me know, I would love to lose my plant killer rep! I can't wait to see what others write! Megan and Sara, I am so glad I'm not alone! Most of my family are good with plants, I guess we all have different gifts! :-) Tiffany, glad you can relate too, and thanks about the blog, Melissa @ Eliza Grace design is amazing!